Cold and flu season is officially upon us. 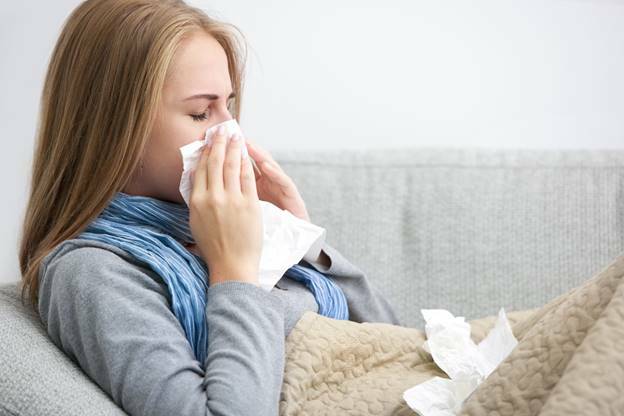 Despite your best efforts to protect yourself against illness, you may soon find that you’re holed up at home with a box of tissues by your side and a pile of blankets on top of you. Sickness can make you feel miserable from head to toe; having a cold or flu can even have a direct impact on your oral health. A dentist is here to discuss some tips that can help you protect your teeth when you’re suffering through a case of the sniffles (or worse). When you’re not feeling well, it becomes all too easy to let your everyday good habits, like brushing your teeth, fall to the wayside. However, remember that you’re just as vulnerable to tooth decay when you’re ill as when you’re healthy. Do your best to stick to a thorough oral hygiene routine that includes twice-daily brushing and once-daily flossing. Keep in mind that you should be careful about when you brush your teeth. If your flu causes you to vomit, it’s unwise to brush your teeth immediately afterward because he acids in the vomit temporarily weaken your tooth enamel. It’s best to simply rinse your mouth with water after you throw up. Wait about 30 minutes before brushing your teeth. Your body may need extra fluids to fight the virus that is running through your system. You may also have to breathe through your mouth if your nose is badly congested. Inadequate fluid intake and prolonged mouth-breathing can both make your oral cavity extremely dry, which increases your risk of tooth decay. Be sure to drink plenty of water and eat hydrating foods, like chicken soup. Gargling with salt water can rinse away bacteria in your mouth and reduce throat irritation. To experience the best results, dissolve about one tablespoon of salt in a glass of warm water. Gargle and spit your way through the entire glass. Many cold and flu medicines, particularly syrups, contain sugar to make them more palatable. It’s best to skip such medicines in favor of tooth-friendly alternatives. For example, you may be able to find one that is sweetened with xylitol, a natural substance that can help protect your teeth by preventing bacteria from sticking to them. Also, you might want to drink ginger ale or lemon-lime soda to settle your stomach. Choose sugar-free versions of such beverages, and drink them in moderation. Even varieties without sugar can harm your teeth due to their acid content. Hopefully, you’ll be able to stay healthy throughout this cold and flu season. However, if you do get to feeling under the weather, use the above tips to protect your smile. Dr. Erick T. Anderson is proud to provide general family dentistry to the Colorado Springs community. If you have questions about how to protect your teeth this cold and flu season, or it’s time for your next checkup, contact our office at 719-593-0988.